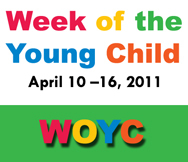 Happy Week of the Young Child 2011! All across the nation, child care and early education programs, parents, and advocates are celebrating the Week of the Young Child. This week, designated by the National Association for the Education of Young Children (NAEYC), is a time to celebrate the joy of young children in our lives, focus public attention on their needs, and honor the importance of the people and programs that care for and educate them. View a listing of events and activities that are taking place this week in Wisconsin here! •	Identify the aspects of your program that you believe demonstrate quality and celebrate them. •	Engage in self reflection: What brought you to this work? What keeps you here? How is your work making a difference in the lives of children and families with whom you build community? •	Re-commit to making this a better profession by engaging in one advocacy activity. •	Set aside this week your anxieties about what lies ahead in terms of implementation of YoungStar and whether or not you’ll have the resources to do what it takes to meet your goals. We’ll work on this together over the coming year; we’ll celebrate successes and confront barriers together. • It takes more than good intentions to provide good care; young children count on their caregivers to understand their development, provide playful learning opportunities, establish trusting relationships, and keep them safe. • The early learning experiences offered to your child now can lay the foundation for future success in school and beyond. Research shows that the education and retention of early childhood educators influences the quality of care offered to your child. • Child care is among the lowest paid jobs in our country. Low wages contribute to high turnover of staff and lower quality care. • Take time now and throughout the year to appreciate your child’s teacher(s). This entry was posted in Uncategorized and tagged child care, Early Childhood Education, ECE Professionals, Week of the Young Child. Bookmark the permalink. ← A Change in Budget Hearing Locations!